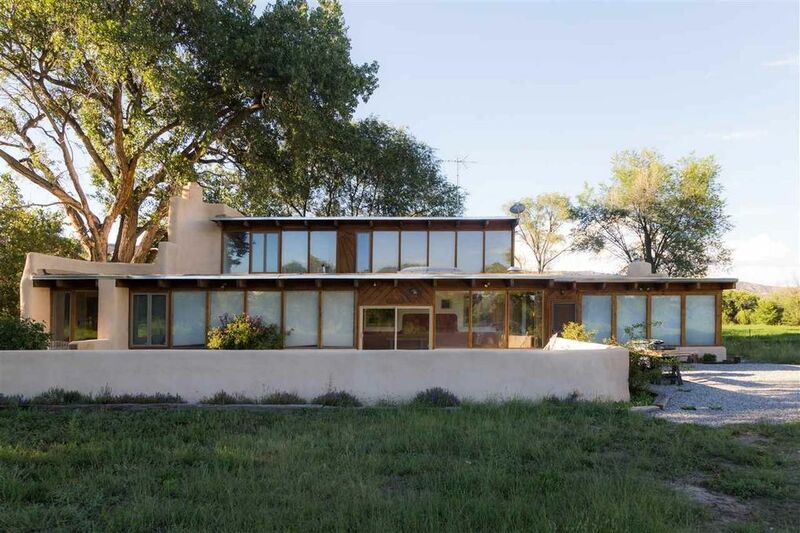 You'll love this home on a large, serene lot on the banks of the Rio Grande River. The home offers tons of natural light and a solar gain from the solid trom wall on the south facing side of the entryway. You're welcomed into the home through the cheerful sunroom into a large family room with Saltillo tile and a kiva fireplace. The open concept kitchen has plenty of space for an eat in dining space or future installation of an island. The laundry room is off the kitchen and is large enough to be a spacious pantry or an office. From the kitchen, you'll walk into a large living room with beamed ceilings, and kiva fireplace. Upstairs is an oversized master suite, with large windows. The 14.4 acre lot is fantastic with over 700 feet of waterfront. The land is flat with underground irrigation system, and perfectly situated for horse pasture or farming, with potential for a future commercial or organic farm. The home has a private well and abundant irrigation and water rights. If you're looking for a little dream plot of land to farm or raise animals, with a fantastic home, this could be the one for you. Just a 40 minute drive to Los Alamos. Call to schedule an appointment to see this beautiful property today! Directions: Head north thru Hernandez toward Chama on highway 285. Turn right on NM74 toward Chamita and El Duende. (About 5 miles from Espanola) Cross the river and come to an intersection then turn right toward Chamita. In about 2-3 miles there is a left turn north to El Guique road. (This may be marked as NM 582). This turn is before the bridge! Continue about 3.6 miles and look for a yellow gate on the right and a white sign on a big cottonwood tree #368.